Spinach stirred in a thick and luscious Béchamel Sauce. 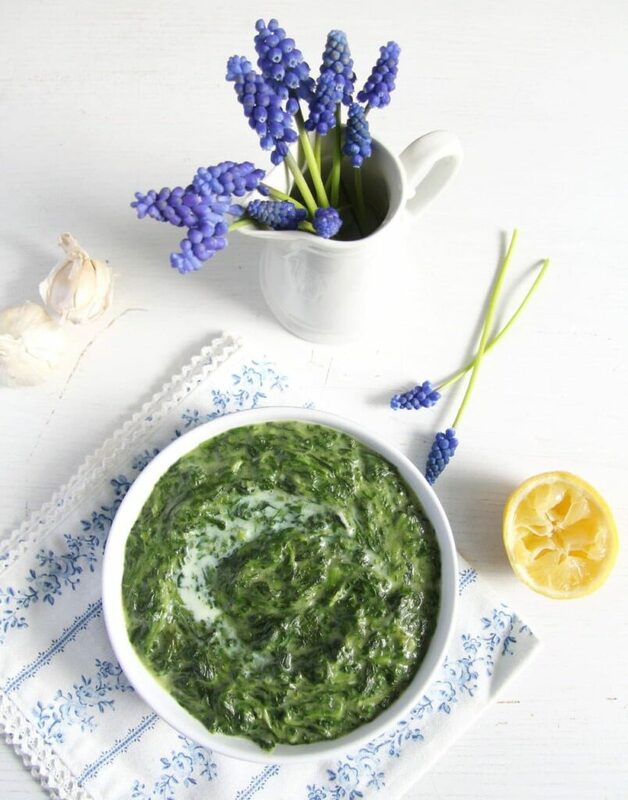 This Spinach in Béchamel Sauce makes one of my favorite side dishes. It is tasty and has that comfort feature that we all love when it comes to food. 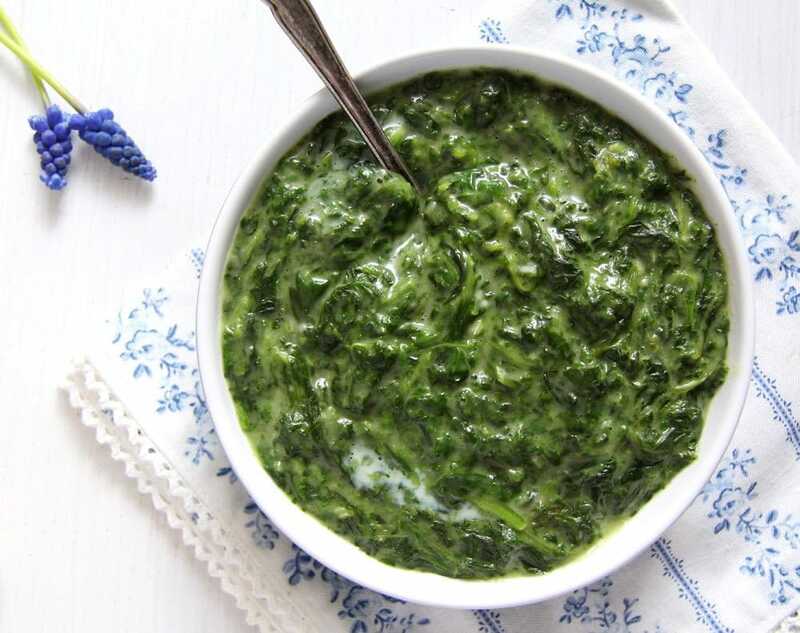 Even though it is not something my grandmother ever cooked, her way with spinach was even simpler than that, it is a dish that has become a classic the first time I’ve ever tasted it. It is something that my aunt Geta cooks often and it is in her house that I have tasted this dish for the first time. My aunt Geta is my second greatest source of Romanian recipes you will find on this blog. First of all my grandmother of course, I grew up on her cooking and I managed to get most of her recipes before she got too old and too sick to remember them. But if I ever miss a recipe I always turn to Geta, she knows all of them and even if she might have changed some of them to suit her family’s taste or because she is slightly more adventurous in the kitchen than my grandma ever was, the principles are the same. And as a bonus: she loves to bake, and baking is something my grandmother almost never did, so when it comes to baking Geta is the only one. 🙂 Like in the case of this amazing Apple Cake. Not to mention that Geta’s cooking repertoire is much larger than my grandmother’s, she even cooks many of those Romanian dishes my grandmother never would have cooked, because they contained something like butter or milk… Yes, my grandmother was a pioneer of dairy-free eating before this term was even invented, I suppose. At least in Romania, I strongly doubt anybody has ever imagined eating dairy-free in the 1950’s when my grandma got married and started cooking. She didn’t like eating anything white, she would say, so no milk, butter, white cheese, cooked and visible egg whites (only scrambled eggs) or plain cooked rice, rice we had often but only cooked in broth to make it yellow or with tomatoes to make it red. I remember her saying that if milk and butter were blue, she would eat them. 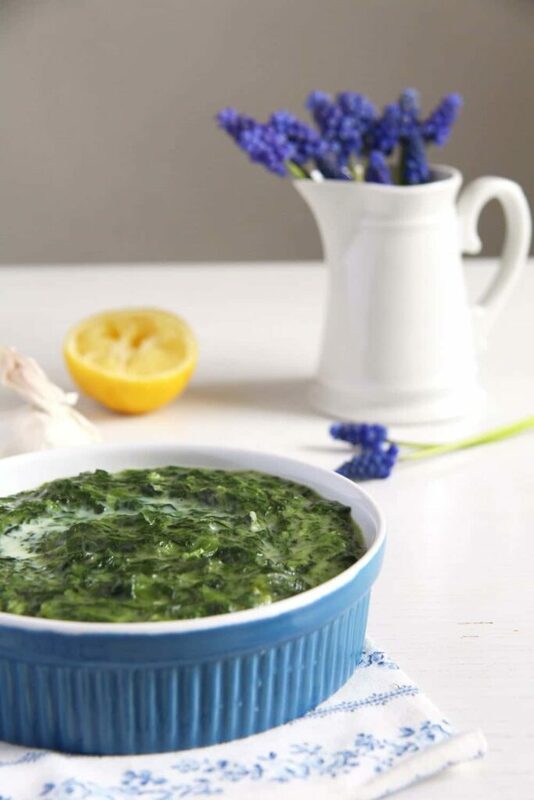 One of the biggest cooking crimes in her eyes was to put milk or cream in savory dishes, like this Creamy Spinach with Béchamel Sauce and Garlic, she thought that to be the peak of disgusting. So it was only margarine (yellow) or oil for us and we barely ever had milk in our house, only for making milk rice (white), which I demanded to have once or twice a year and which she would only make for me, she would not touch it. So I vividly remember the first time I ever ate mashed potatoes made with butter and milk (I was about 16), and I have to say that I was shocked at how different they were from my grandmother’s version with oil and potato water. 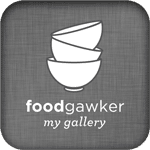 It was in Geta’s house that I had those wonderful mashed potatoes and from that moment on I’ve started to doubt my grandmother’s cooking theories about milk and butter, which I found to be perfectly right up until that moment. After that came the Romanian Aubergine Salad made with mayonnaise instead of only oil, my grandmother never like that, so I’ve learned to make mayonnaise only to be able to enjoy this salad with mayonnaise from time to time and this Creamy Spinach in Béchamel Sauce with Garlic, which is sooooooo much tastier than its plain oil version. 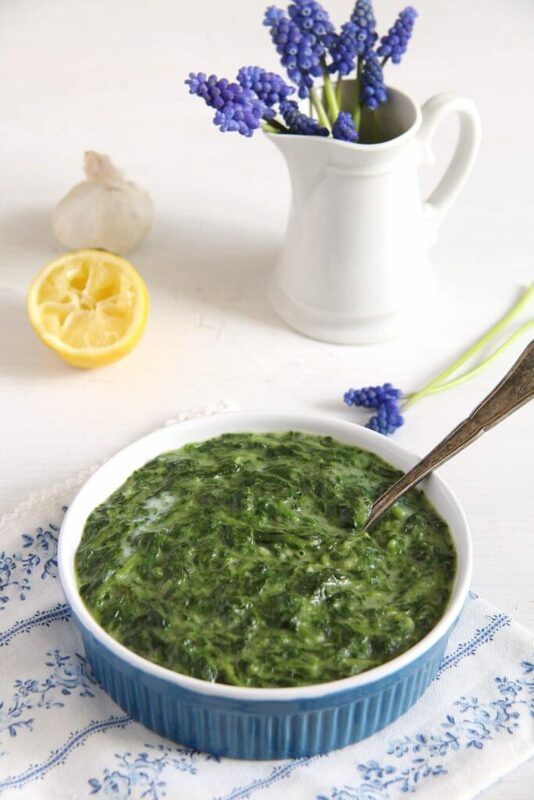 I do hope you give this dish a try, it is so easy to make, it would be a great, fuss-free introduction to Romanian cooking and I am pretty sure that if you like spinach, you would love this. It makes a great side dish for fish or chicken for instance (we had it with fish and green spelt berries last week – wonderful! 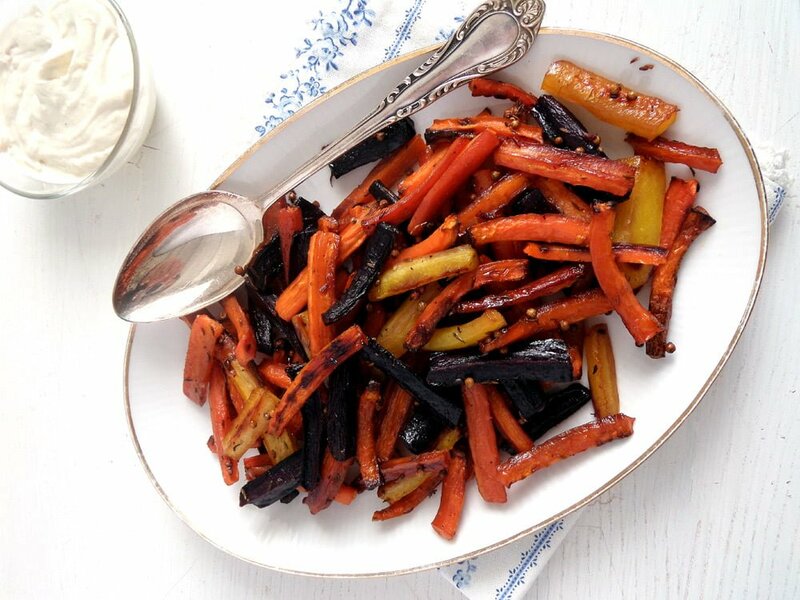 ), but you can have it as a main dish with a poached egg or scrambled eggs on top and a slice of bread on the side. 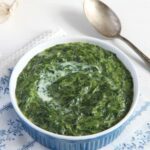 I usually make this dish with frozen spinach, it is more convenient and I can get it any time of the year, but of course you can substitute fresh spinach for it, that would be the real traditional Romanian way. The sauce is slightly different from a typical Béchamel Sauce, I replaced about half of the milk with vegetable broth, I feel that brings on more flavor and spiciness. But feel free to use only milk, if you wish. 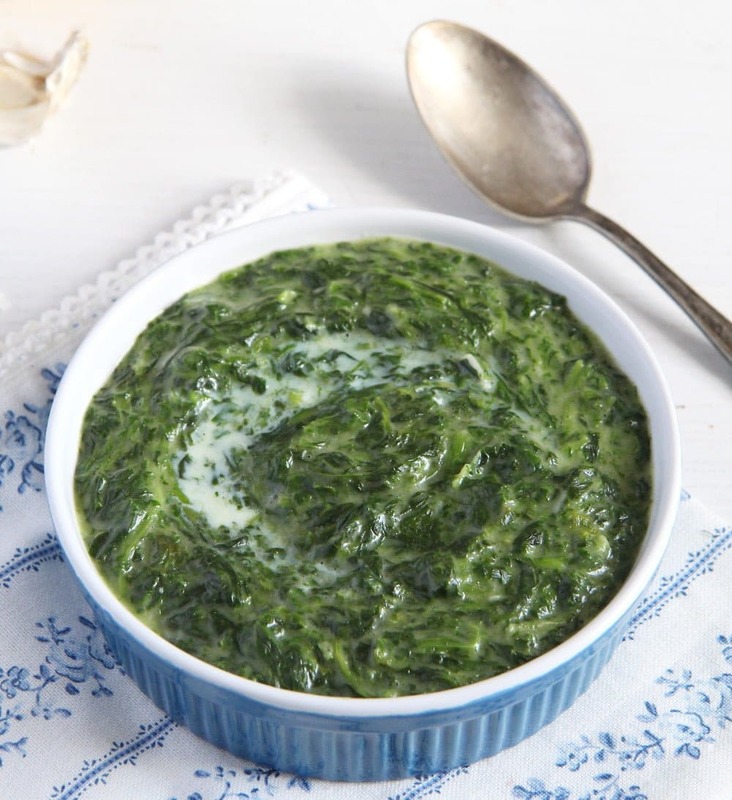 This Creamy Spinach with Béchamel Sauce and Garlic serves 4 as a side dish or 2-3 as a main dish. If using frozen spinach place it in a pot, add about ¼ cup water and let it thaw slowly on low heat. Or you can leave the spinach to thaw before you start cooking. Stir from time to time. When thawed continue cooking for about 5 minutes or until the spinach is soft. Let drain in a colander. If using fresh spinach, remove the stems and chop the spinach very roughly if the leaves are large. Wash it and give it very wet to the pot, let wilt and cook for a few minutes until soft. Let drain in a colander. In the meantime make the Béchamel sauce. Heat the milk slightly in a heat proof jug. Melt the butter in a medium heavy-bottomed saucepan. Sprinkle the flour on top and let it get slightly golden while stirring all the time, about 2 minutes. Slowly start adding the milk, while stirring or whisking (I prefer to use a whisk) continuously. Add the vegetable broth as well and keep stirring. Bring to a boil and let the sauce thicken, this will take about 5 minutes, continue to stir. The sauce should be thick and coat the back of a wooden spoon. Add some nutmeg and salt and pepper to taste. Mix the drained spinach and the Béchamel sauce together. Add the lemon juice and the finely grated garlic cloves. Stir well and adjust the taste again with salt, pepper, nutmeg and lemon juice. Serve hot. Aww, it looks delicious. I usually make Spinach with onions, but I like this version better. Oh my, your Grandmother sounds like quite the character and a pretty unique woman. Perhaps you may have been able to sway her (like your mother-in-law) with your delicious cooking and especially this spinach! It looks so creamy and rich, I just want to smother a baked potato with it and dig in! She was one of a kind… 🙂 Sometimes I feel I am using this blog as some kind of therapy tool. 🙂 🙂 And I never could have persuaded her to try something else, I cooked chili con carne for her the first time I went home after starting to cook myself and she refused to taste it, she said I didn’t cut the peppers like one should and did not add the ingredients to the pan in the right order. Not to mention all the weird spices I used. Needless to say she had no idea what chili con carne actually was, what it contains or how it is supposed to be cooked, but she knew better.